Seputeh Heights is a reflection of prestigious refinement. 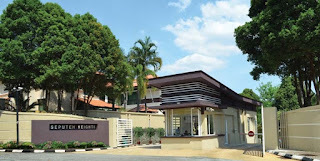 This gated and guarded development of 36.04 acres is strategically located between Kuala Lumpur and Petaling Jaya and is highly accessible from various parts of the town where it is nestled only mere minutes away from the hustle and bustle of the city and thriving commercial centers like Bangsar, Midvalley and KL Sentral. This freehold low density development with only 103 bungalow lots, with land areas ranging from 7,992 to 23,100 sq ft, ensure you of your privacy and exclusivity. This exclusive bungalow development is also supported by the convenience of numerous public amenities and activities, established schools and colleges, hotels and restaurants. Already a thriving neighborhood, this exquisite and beautifully landscaped private bungalow estate offers security features including a 24 hr electronic surveillance and mobile patrols security. Seputeh Heights is indeed a distinguished taste for living that exudes prestige, privilege and prosperity. Built-up Area : 7,992 sq.ft. - 23,100 sq.ft.